This is a silly jam out video that my love created when his pals were up for a weekend. My love is the one on bass, my brother on the black drum set and his friend on another. They were just messing around. I was talking in the background with his other buddies. But, I have a feeling I’ll be in the next jam out video. I am quite fond of instrumentals. Especially when I feel that the music can tell a story. Fill a void within your body. Stir up a feeling of emotion. Music makes us feel human. No matter who we are, we get lost in music. We can feel it grip us. Instrumentals I feel have a deeper connection to us. Why? Because it’s just the instrumentation connecting with us. Leaving it up to us to interpret the story and cause a curiosity – bring about a world of fantasy and imagination! When I need to break away from reality, my favorite instrumentals are my key. It’s funny how I interpret the songs – even when heard plenty of times – a different way depending on my emotion that day. I feel very fortunate to have this confidence and connection with my humanity. Many people deprive themselves of this marvelous and curious connection. I have to thank music for being my confidant for so long and my companion to keep me keyed into humanity. To keep me from shedding my humanity shell and to chase after my dreams. It gave me self empowerment. Hope. Love. Hate. Pain. Good. Evil. It gave me a connection to the natural world. This is my opinion on instrumentals. Have you ever had to suffer the consequences due to an other person’s actions? I have for a majority of my life and I’m getting tired of it. The more I show that I am not the person that did the horrid deeds the more and more I have to pay becuase I am a child of that person. You see creeps – my mother made poor decisions. And didn’t have to pay for her actions whatsoever. After she took off — I HAD to deal with what she created and still do ’til this day even though that was back in 2007! You my lovely Ghouls – For some reason my mother had to go around and ruin my reputation. Claiming I’m just as she when in reality — she doesn’t know me at all. I get the backlash from her actions when I didn’t do anything wrong. I was a kid at the time all this was happening. So how on earth could I cause anything? That’s right I couldn’t! For so many years I had to put up with bullying, harrassment, and accusations because of the woman that gave birth to me. When will enough be enough?! When will it be her turn to pay for the actions she put forth!?! Why should I be the scapegoat to her madness? I shouldn’t! I had to deal with her drinking, her abuse, and lies for what? So she can have a cheap thrill? Truth of the matter is – Don’t let this sort of crap get you down. Sure you may need to vent like I did above. But you’re better than the person that caused the ruckus. You’re the champion going after your dreams. You’re the individual that will have life they’ve always wanted. Because you learned how NOT to be in life. There will be days when you ask the ever so popular: “Why Me? !” Truth is, that question will never be answered. That is because there isn’t one. No one knows why you were chosen to go through situations like that. But take the negative to fuel a positive. Take that angst and gear it towards your dream career. Gear it towards productivity. I say this because no matter how much you confront the individual(s) that created a monster for you – They’ll never get it. It’s like talking to a wall. You seriously need to throw out all the fucks you give and head on through. Stand tall and proud. While those individuals will cower and crawl! Make your mark in this life. Whether it be large or small. Because the one thing you should never have to do is be ashamed of the situations you’ve been through – and most of all you should never be ashamed of who you are! I must share with you my obsession with Night Gallery. This sequel to the television series, Twilight Zone (although not as epic as Twilight Zone), has always been one of my personal favorites. I’ve always been a fan of all vintage horror television series. It’s so interesting how the tales of horror and such pertain to certain aspects of current living. It’s as if in mysterious tales they predicted the future. It’s quite uncanny and makes you think. That’s one thing I love in this world. If a film or t.v. series can really put your brain to work — it’s worth it. That is what we’re missing in today’s television and films. He comes along after the theme song walking along a bunch of unusual paintings. The paintings usually have part of what the short story will be about. 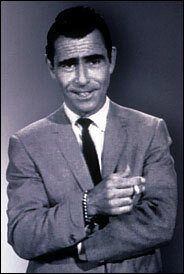 Serling’s introductions are quite intriguing and get you interested in the tales for the evening. My favorite episode would have to be from Season 2 — The episode entitled: Question of Fear and also the Class of ’99 which stars my ever so favorite, Vincent Price. Although these tales are of horror, mystery, uncertainty and more… it gets deep within your soul and triggers deep thought. I’ve always been inspired by shows like Night Gallery, Twilight Zone, Outer Limits etc. Always peaked my interest as a child and even more so now as a young adult. Although, Twilight Zone the Original Series will always be my favorite — the cheesiness of Night Gallery holds a special place within my heart. I thank these shows for inspiration for my writing, my confidence in being the twisted individual I am, and my music.